There is really no voice that compares to Barbra Streisand's. It's hard to even pick which song from the soundtrack to use for Music Monday, because I love them all so much. I'm choosing this one- the song used in the movie's final scene- because it had me bawling my head off as I watched the movie last night. I read that Barbra insisted on doing all the singing in this movie "live and in one take"- How she could convey the emotion of that scene where she borders on crying but can sing through it is baffling to me. And I LOVE hearing the little shakes in her voice- This is Esther Hoffman Howard singing, and whoa! is she powerful. In my opinion, the current version of "A Star is Born" with Lady Gaga and Bradley Cooper is admittedly done better screenplay and acting wise, but the music in this one with Barbra and Kris: Mind blowing... It still moves me deeply! I was pretty stoked one day when I was at the library and saw the new Stephen King book, The Outsider, on the shelf. My library has "my lucky day" stickers on certain books. They're books that lots of people want to read and if they have one of these four leaf clover stickers, it means no one is allowed to put a hold on them. If you happen to see one, then hey! it's your lucky day! I can't believe I'm saying this, but once I got all the way to page 391, I decided I was done and I would not be finishing this one. 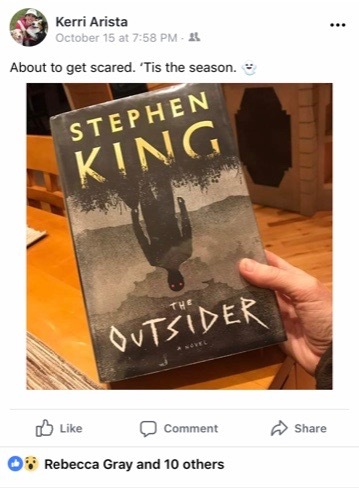 and this is where I leave you, Stephen King. For about the first 150 pages or so, I liked it a lot! There was a murder- an extremely disturbing child murder. The beloved high school coach looked to be the likely suspect and so, he was arrested and handcuffed during the football game in front of the whole town. Then, we start getting more and more witness accounts, his alibi, etc and it seems that maybe he didn't do it after all. A life-ruining wrongful accusation. And a perplexing mystery. I was into it. It seemed like something that could happen in real life. Because, well, IT DOES! I don't wanna give anything away about the book. But I'll just say, it became sci-fi, and I quickly knew this book was no longer my jam. Fiction by definition is writing that describes imaginary events and people, but if it couldn't happen in real life, I usually am just not interested. I wish someone had mentioned in the Amazon reviews that this book had a sci-fi/supernatural element to it. Because ugh, that's just not my favorite genre, at all. For those first 150 pages, I had fun reading it. If I'm being honest, I was engrossed! Then I felt more and more lost as the story took it's weird turn. 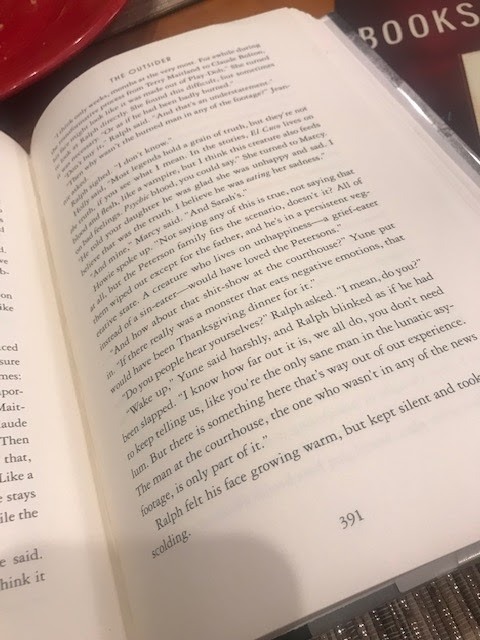 And then yesterday, I got to page 391, and thought "Life is too short, and there are too many good books waiting for me!" I was going to plow through the last 200 or so pages but only to be able to stamp this one as "finished"- and honestly, who cares?! I was getting uninterested enough that reading it felt like a chore. Besides that, the book was such a clunker (size wise) it hurt my hands holding it in the bathtub each night anyway. So I abandoned The Outsider and I feel completely at peace with it! Now, I'm on to the next one. Which I have a little story about how I found it that's pretty cool. But I'll save it and write about that tomorrow- or the next post anyway.